Pinning photos found on the Internet to Pinterest is quickly becoming a popular pastime when sitting at a computer. Pinterest has released a iPhone app to handle liking and repining. 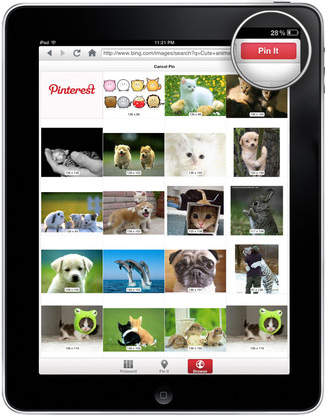 It provides a way to upload photos on the iPhone but does not support finding photos on sites and pinning. 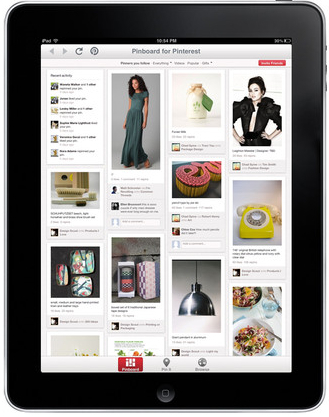 Pinboard is an iPad only app not from Pinterest. There are mixed reviews… issues we have seen are mostly due to the large amount of memory needed to pull down and show so many images that Pinterest supports. Having the ability to share through Pinterest while being completely mobile via the iPad makes a few small hiccup from time-to-time easy to forgive. Sharing is key to having fun on Pinterest. Pinboard offers multiple ways of doing this. There are instructions on how to add a ‘Pin It’ link to the top of the Apple Safari Browser that comes on the iPad. So, like your computer, when you find something to pin while browsing the web, you can. If you would rather not add the ‘Pin It’ link in the Safari browser, copy the Web address to the site with the image you wish to share, then launch Pinboard. The link is auto inserted into the Pinboard internal browser from the iPad’s clipboard. Tapping the ‘Pin It’ button will have a similar experience you have with your computer. You can use that same Pinboard in-app browser to look around the Internet, then ‘pin’ what you find for your friends to enjoy. They will never know you did it through your iPad while being completely mobile.